Special Containment Procedures: SCP-2550 is to be kept in a standard grade avian containment installation at Site-24's "The Aviary", and is to be provided with at least fifty cubic meters of caged, open-air space for health maintenance purposes. SCP-2550 is to be fed a diet consisting mostly of North Atlantic squid with nutrient supplements sporadically administered as necessary. SCP-2550 is not to be exposed to other members of the species Phoebastria albatrus. Description: SCP-2550 is a biotypical member of the species Phoebastria albatrus, also known as the Short-tailed Albatross. Through poorly understood means, SCP-2550 is capable of vocalizing non-lingual human vocal cues, such as growling, sighing, and weeping. 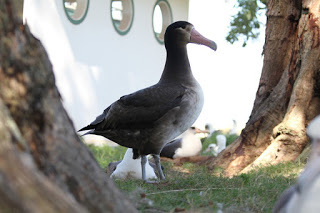 SCP-2550 does not outwardly display any increased intelligence and similarly possesses no advanced biological basis for its ability to produce sounds outside of an albatross' established range. In addition, when exposed to additional members of its non-anomalous species, SCP-2550's ability to produce non-lingual verbal human expression will infect all instances of its species that can hear its vocalizations. These infected birds, collectively designated SCP-2550-A, will display anomalous effects for the remainder of their lives, but cannot spread the effect themselves. SCP-2550's typical behavior deviates markedly from that of the non-anomalous albatross. SCP-2550 remains within its nesting area almost exclusively, only exiting its perch to occasionally eat. SCP-2550 has been noted to avoid eating for prolonged periods, and has necessitated force feeding in the past. Typical avian motivation and care models are ineffective in providing for SCP-2550. Due to mounting evidence and urging on the part of Dr. Gunther, a strict regimen of specifically engineered Phoebastria albatrus SSRIs have been administered to SCP-2550 with varying success in modifying SCP-2550's behavior. Addendum: On ██/██/████, it was decided by 4 to 1 vote by Site 24's Avian Psychological Board that implementing a mural approximation of SCP-2550's natural habitat to the walls of its containment chamber would necessitate a more healthy environment. SCP-2550 was temporarily moved to a holding cell during this process, after which it was recontained with no outlying logistical problems. During the next week of observation, SCP-2550's mental state was seen to deteriorate dramatically. After 8 days, SCP-2550 had managed to strip the bark, branches, leaves, and other assorted foliage and debris from their typical places within its enclosure in order to obscure the approximations of other Phoebastria albatrus included in containment. SCP-2550 was then noted to produce an anguished wail until successfully tranquilized and its containment area returned to its previous state. As of this event, SCP-2550 has been markedly more lethargic and seems more resistant to SSRI treatment. Implementation of more potent psycho-stimulants is currently pending. On ██/██/████, during routine patrol of the Izu Islands archipelago in the Pacific Ocean south of Japan following the detection of anomalous [REDACTED] in reference to the now contained SCP-████, on site agents reported the sounds of human populations within the local flora. SCP-2550 was discovered as a part of a local colony of Phoebastria albatrus, given the temporary designation SCP-Izu-Prime, before its true nature could be ascertained. After prolonged observation, possible in part due to the Izu Islands' remoteness, SCP-2550 was identified as the anomalous component in effect. Researcher's notes during this time suggest that SCP-2550 did not display depressed symptoms while in the wild, displaying such human vocalizations as laughter and delighted exclamations. Subsequently, all instances of SCP-2550-A were exterminated and SCP-2550 was taken into custody preceding final containment at Site 24.